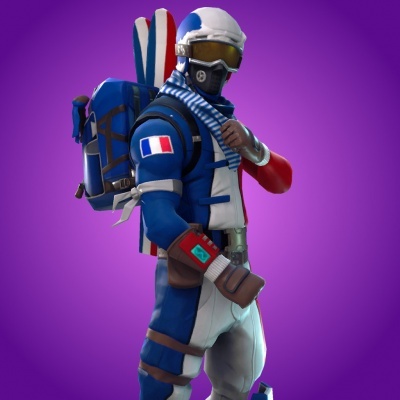 The France Alpine Ace Skin in Fortnite BR. You can buy this costume from the Cash Shop for 1,500 vbucks. Alpine Ace (FRA) is an outfit in Fortnite Battle Royale. It is the French Version of the Alpine Ace skin. This Alpine Skier costume represents France, and its colors match the French Flag. Purchase this costume from the Item Shop. When you buy an Alpine Ace variant, you only get the version of the skin that you bought. You don't get all 8 versions of them. You have to purchase each Alpine Ace variant separately. Alpine Ace (FRA) is the male version of the Mogul Master (FRA) skin.